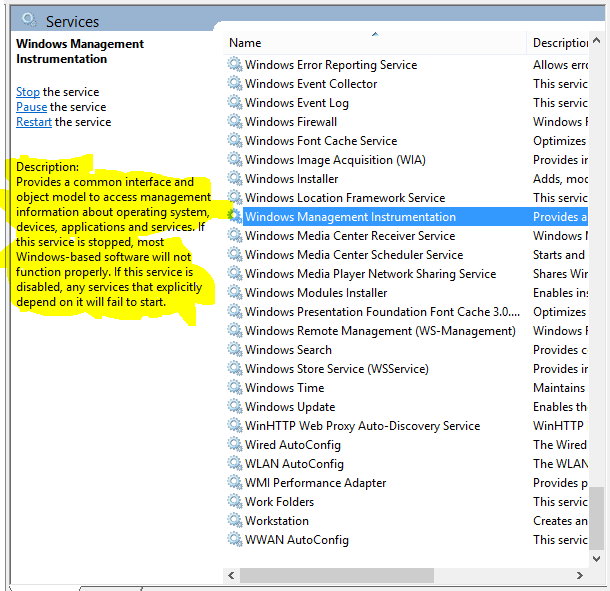 Speccy (a Software-Layer gets its information from the Windows Management Instrumentation service (a Hardware-to-Software-OS-Layer based Translator), which in turn gets it's information from the Hardware-Layer (your devices). It may be, that somewhere along the chain (HWlayer-Translator-SWlayer) the language gets confused (think of a game of what American's call "Telephone"). The first step you should take is to make sure your BIOS is up to date. How to do this varies by machine or motherboard manufacturer. So visit your OEM (such as Dell, HP, Toshiba Etc) or, if this is a self-made machine, Motherboard Manufacturer and learn how to achieve this step. DO NOT EXPECT DEVELOPERS TO REPLY. THEY MAKE ALL EFFORTS TO MONITOR ALL THREADS BUT WILL ONLY INTERACT IF THEY REQUIRE MORE INFORMATION OR TO INFORM A SPECIFIC MEMBER THAT THEIR BUG SHOULD BE SQUASHED (note: this rarely happens don't expect it to happen). DO NOT BUMP OR POST MULTIPLE TIMES FOR THE SAME UNIT. IF YOU HAPPEN TO NOTE THAT A FEW POSTERS UP (or, dare say, you read every entry in what promises to be a long thread) MENTIONED THE EXACT INFOMATION YOU ARE GOING TO REPORT, THIS GOES AS WELL. FAILURE TO COMPLY WILL RESULT IN PART OR ALL OF YOUR POST BEING EXCISED. Temperature reported for CPU's is nearly always above 100C. Did a long sleep and woke PC, the temperature displayed was 77C while room temperature was 23C, so reported temperature seemed about 54C high. As I type this, the mother board temp says it is 38C while CPU temp is reported as 87C (Ambient is 23C). I'm using your softwares for a long time and I saw something : at the beginning speccy shows me temp equal to the manufacturer software, then it shows me 0 to 5 temp, and now it doesn't show the temp. My PC config didn't change so I'm really interesting to know why ! The touchbios software from Gigabyte can read the temp. If you can't do something it's not a problem ! I have used Speccy on my older WIN XP PRO SP3 computer for several years and found Speccy's hardware info helpful. Recently, a Friend gave me a Windows Vista Home Premium 64-bit SP2 computer, which I installed Speccy on. And I was shocked to see some of the hardware temperatures Speccy gave me. Such as 169 degree F on my graphics card. And at that time I wasn't doing any "heavy duty" video work. Just browsing the internet. It seems like if that temperature was accurate , my computer case would be hot to touch. I'm attaching a file with some of the hardware temperatures Speccy recorded. Any comments and replies would be appreciated. APU temp is showing averages between 60c to 74c, nominally hovers around 66c. The lowest it has gotten to is 52c. Since Graphics is integrated with CPU, i am listing graphics temperature: averages 8 to 12c. According to these readings, my APU wouldn't exist anymore in its present operating state. Other readings: Motherboard temp shows 27c, HDD showing 32c. It appears that my motherboard and HDD readings are correct however the readings for the APU (CPU and graphics) is off the charts for its normal tolerated temperature maxims. I used Openhardwaremonitor app, and it shows all but the CPU temps. AMD System Monitor app doesn't read CPU or graphics temps, odd. Core Temp app showing averages of CPU temp between 6c and 26c. This is sensible readings as the room is already cool with a good cooling system. 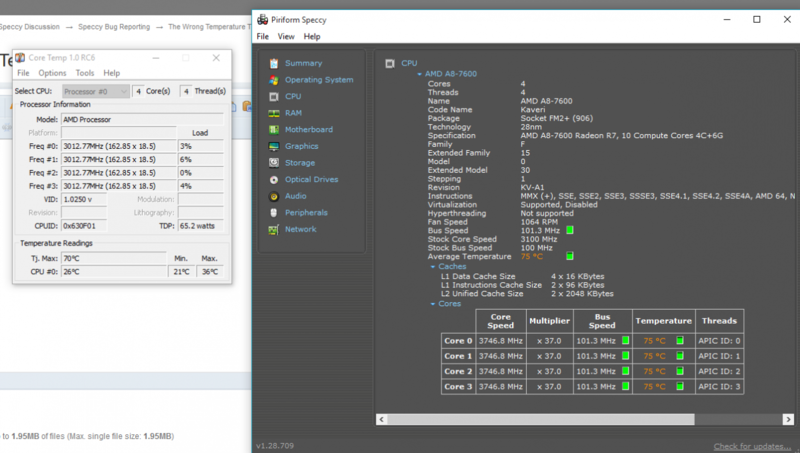 Speccy shows about 30F higher than other cpu core temp monitors... SSD temps seem fine. Thought Win10 was the prob. But it shows normal on here 31 c.
Only since Windows 10 installed. ASUS released a new BIOS version June this year, maybe try that just in the off-chance it makes a difference. Speccy appears to read the CPU temperature at approximately 50C higher than other software. When my PC is idle, CoreTemp reads 14C and Speccy reads 64C. When gaming, CoreTemp reads ~45C and Speccy reads around 95C! This had me seriously worried for a second! Thanks for looking into this and I hope you diagnose the issue. Yesterday I measured a temp of 115 celsius for my motherboard. Core: 32. Think it is a bit high? But could it been a wrong measurement? Because after cleaning, I connected the PC again and after login motherboard showed 119 Celsius!! Motherboard temperature showing 115 degrees, CPU showing 32 degrees. 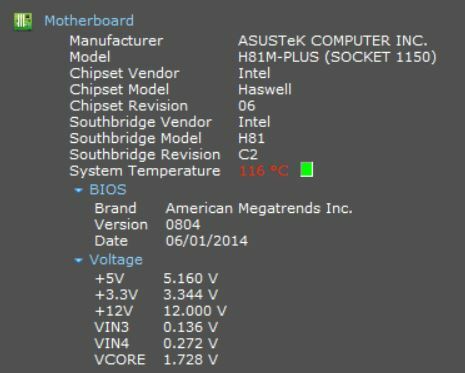 Hi All, Speccy was reporting my laptop motherboard temp correctly with Windows 7, but after upgrading to Windows 10 Speccy no longer reports any temp for the motherboard. i.e. not wrong, but null under Windows 10. The CPU, GPU and HDD temps all same as before the upgrade. Anyone else see similar change in Speccy behaviour after Windows 10 upgrade? Did not test on windows 10 x64 enterprise if needed i can do so . hi , speccy shows wrong motherboard temperature in windows 10 x64 (112c) ,and sometimes when i run speccy , it Causes the blue screen. my mb is asus H87M-E and all drivers is updated.